Keep The Dandruff Away:Dandruff is one of the most common issues that occur because of extreme dryness of the scalp. 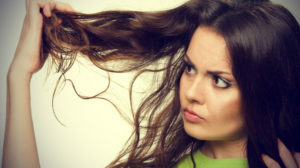 It is one of the main causes of hair fall in winter. Use an anti-dandruff cleanser to prevent hair fall. Don’t Tie Your Hair Too Tight:Tight ponytails or braids are a big no if you’re trying to control hair fall in winters. Wear your hair loose, even while going to bed. Gentle Combing:In winters, hair is already dry and damaged due to lack of moisture in the air. Try and comb only when required and be as gentle as you can. Have A Healthy Diet:Have a Healthy Diet: Include loads of vitamins and minerals in your diet by having fruits, vegetables, whole grains, and nuts. Make sure you stay away from processed food, sugary items, and fatty food. This will help control hair fall. Hot Oil Treatment:Using a hot oil treatment during winters is a great way to add nourishment to your hair and prevent hair fall. Apply some warm olive oil or coconut oil on the scalp and the hair strands. Leave it for about 1-2 hours. This should be done at least once a week to give you the desired result. Apply An Avocado Mask:Avocados are supposed to have lots of vitamins and minerals that can deep nourish the hair strands and treat dryness and hair fall. A mask made of mashed avocados can be applied on the hair and left for 45 minutes before washing. Follow it every 7 days to get the results. Do try these tips and share your experiences below.